This tutorial uses the HTML and CSS to change the default mouse icon. The auto parameter is added to the icon as a backup which will be the default icon. The Inkscape document properties were set to 50px wide by 50px high. 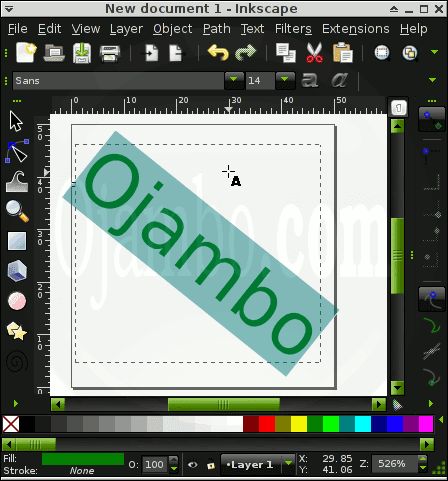 The text tool was used to create a text icon. The image was saved as an SVG file, but Inkscape allows saving as PNG files. The SVG file was imported into Gimp. 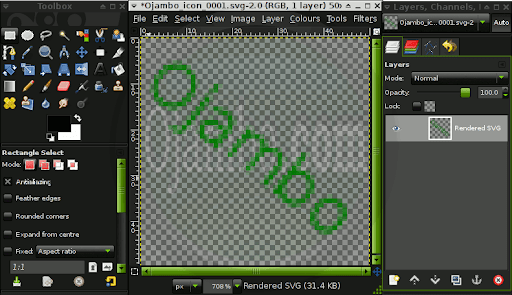 The text tool can be used to create a text icon. The image was saved as an GIF file because it was the smallest size. The CSS used in an internal style sheet inside the head tags. The cursor is display using the url to specific the icon location. Run the HTML-Cursor-Icon.html file in your favourite browser. Mouse over the coloured box to see the new mouse cursor icon. A Mouse cursor icon can be created in any graphics editor. A vector file was created in Inkscape and a bitmap copy was optimized in Gimp. CSS used url to load the new icon. Keep the icon sizes small. Optimize images to make them smaller and web-friendly. Use auto to utilize the default icon as a fallback method. This entry was posted on Wednesday, November 16th, 2011 at 12:00 am	and is filed under Tips & Tricks. You can follow any responses to this entry through the RSS 2.0 feed. You can leave a response, or trackback from your own site.